The FREEDOM SHARE Card is an additional type of FREEDOM Card for customers who wish to use it at SEPTA Key Card readers. The FREEDOM SHARE Card is an account-based system where transaction information is stored on a central computer rather than on the actual physical card like current FREEDOM Cards. An account-based card is required for integration with SEPTA’s account-based fare collection platform. Sales of SEPTA tickets from PATCO vending machines ended on September 30, 2018 and a FREEDOM SHARE Card or SEPTA Key Card is required to transfer to SEPTA from PATCO. The cost of each SEPTA trip will be $2. The FREEDOM SHARE Card is accepted on all SEPTA modes of transport except Regional Rail. Do I have to get a new FREEDOM SHARE Card? No. Those riders who frequently travel from PATCO to SEPTA, and vice versa, are encouraged to get the new FREEDOM SHARE Card. If you do not travel from PATCO to SEPTA, you do not need to get the FREEDOM SHARE Card. Where can I get a FREEDOM SHARE Card? 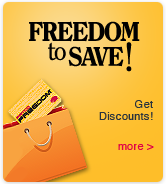 FREEDOM SHARE cards are only available at FREEDOM Card Service Centers. Broadway FREEDOM Service Center Hours: Monday-Friday 7 a.m. to 7 p.m.
Woodcrest FREEDOM Service Center Hours: Tuesdays 10 a.m. to 2 p.m. & Thursdays 2 p.m. to 6 p.m.
To make the transfer faster, pre-complete the FREEDOM SHARE Card registration form prior to your arrival to a FREEDOM Service Center. Is there a cost to obtain a FREEDOM SHARE Card? FREEDOM SHARE Cards are available free of charge at this time. Can my existing FREEDOM Card value can be transferred to the new SHARE Card? Yes. Staff will transfer your balance from your FREEDOM Card to your SHARE Card. How do I check my FREEDOM SHARE Card balance? Balance inquiries can be made via the PATCO FREEDOM Card website by visiting patcofreedomcard.org. Inquiries can also be made by calling the FREEDOM CARD Service Center at 1-877-373-6777. Am I able to check my transaction history online? Yes. In addition to being able to check your transaction history, you can also add value to your card, view/edit payment information, view/edit account information, change your password and cancel your web account. How can I replenish my FREEDOM SHARE Card? Recommended: Credit card automatic replenishment when your card reaches less than $5. In person at a PATCO FREEDOM Card Service Center. Directly loaded by a transit benefit partner. You must provide your benefit partner your new PATCO FREEDOM SHARE Card number. If you receive paper Transit Checks, simply continue to mail or hand in person at a FREEDOM Service Center. 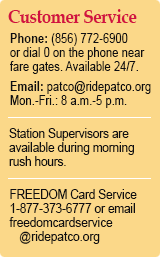 Please remember to provide your new PATCO FREEDOM SHARE Card number. Can the FREEDOM SHARE Card be reloaded at the station ticket vending machines? No. They are only able to be reloaded using the options listed above. Can I use the FREEDOM SHARE Card to purchase tickets at the station ticket vending machines? No, the FREEDOM SHARE Card will not interact with ticket vending machines. Will the FREEDOM SHARE Card work with SEPTA buses? Yes, the FREEDOM SHARE Card will work with SEPTA KEY readers for subways, trolleys and buses. The card will not work with SEPTA Regional Rail lines. Are the discounted transfers going away? Yes. Sales of SEPTA tickets from PATCO vending machines ended on September 30, 2018. With the FREEDOM SHARE Card, can you pay for individual rides? Yes. You will be charged by the ride, it is not round trip. Will the FREEDOM SHARE Card work for entry to paid PATCO parking lots? Yes. The FREEDOM SHARE Card works exactly the same as the current FREEDOM Cards in regard to getting into paid lots. If I currently have a T-Card, can I still switch to a SHARE Card? Do I need to get a new T-Card sticker on my SHARE Card? No. Please remember, T-Cards are not valid for parking. Contact a FREEDOM Service Center for additional details.